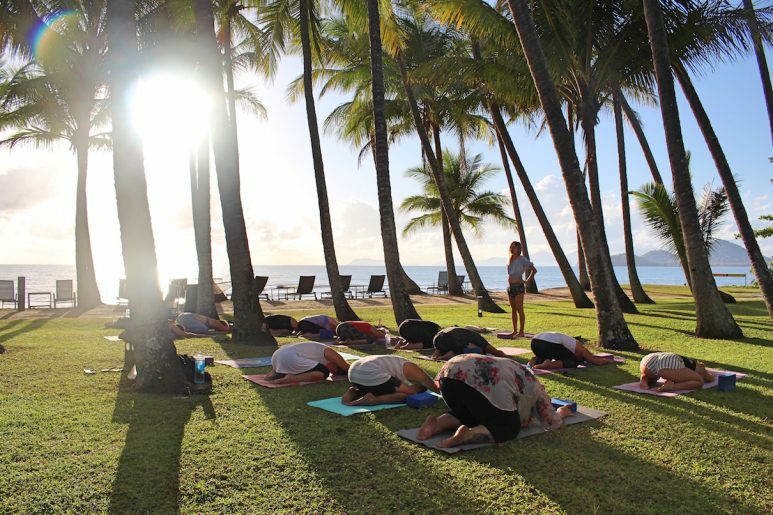 Most of our classes (Monday PM, Tuesday AM, Wednesday AM, Saturday AM- see full schedule below) are held on the beachfront, outside of Alamanda Resort, Palm Cove. On the corner of Williams Esplanade and Veivers Road (at the South end of Palm Cove) follow the footpath down between the palm trees, past Nu Nu restaurant until you are in front of Alamanda Resort. Classes take place on the grass under the shade of the Palm trees. 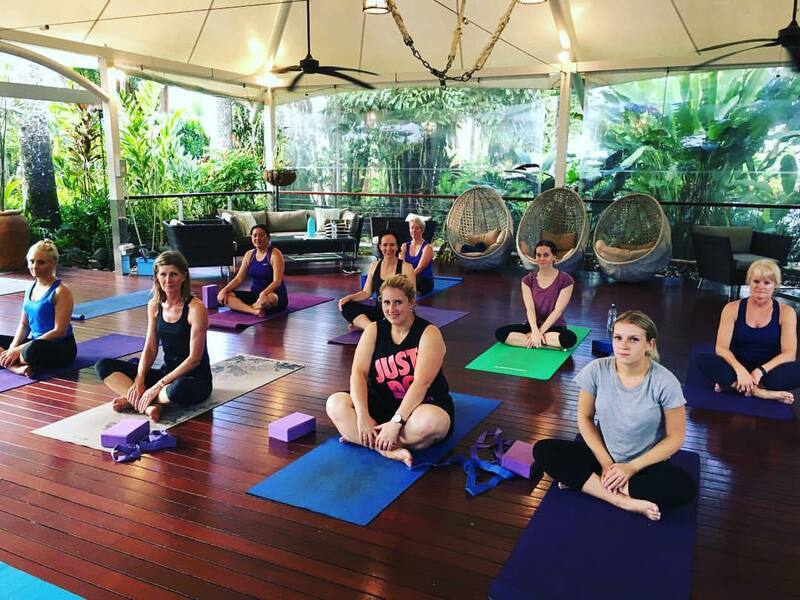 On Friday mornings, our class is held at Imagine Drift Resort in Palm Cove, on the spacious deck next to the lagoon swimming pool. You can find this resort just over the road from Alamanda Resort, also on Veivers Road. Visitor parking is available at the resort. 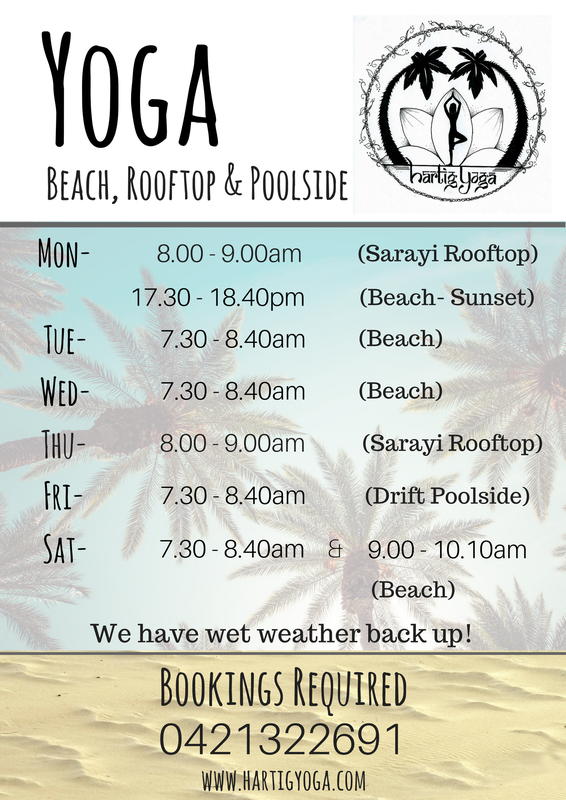 Monday and Thursday morning classes are held on the rooftop of Sarayi Hotel – 95-97 Williams Esplanade, Palm Cove. Walk through the main doors and head up the stairs to find this beautiful space amongst the tree tops and in front of the ocean. BOOKING REQUIRED at all of our classes. Drop in may be OK, however its best to book to avoid disappointment as maximum/minimum class numbers apply. $17 per class (or $15 if you bring your own mat). $65 for a 5 class pass. *5 and 10 class passes are valid for 6 months from the date of purchase. Passes are non refundable. These passes are for individual use only. Booking is required. 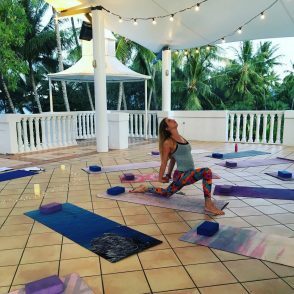 To book a place at one of our Palm Cove Yoga classes, call or text Beth on 0421322691 or send an email to bethanyhartig@gmail.com. Once we have confirmed that there is a space available in the class that you would like to attend, you can pay for your yoga classes online by selecting the amount of classes you would like to book below and following the on screen instructions. *5 Class passes are available for $75 and 10 classes for $150 (this includes mat hire if needed). These passes are for the use of individuals only. *Please call/text/email us before you pay to ensure there is space at the class you would like to attend. Yoga Class Passes- book more classes and save! Kids are welcome at all of our yoga classes, as long as they are accompanied by an adult aged 18+. Although our classes aren’t designed specifically for children, they are more than welcome to come along and start enjoying the benefits of yoga early in life 🙂 A child is anyone under the age of 16 (16+ is charged adult price). *5 and 10 Class Passes are valid for 6 months from the date of purchase. All class passes are non refundable and are for individual use only. For Rooftop Classes – The rooftop is under a canopy, so they can continue as normal. 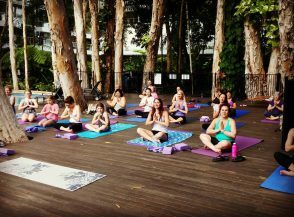 Hartig Yoga brings unique Hatha, Hatha flow, Yin/Yang and Vinyasa Yoga classes to Palm Cove, Far North Queensland, Australia. The classes last 70 minutes and include asana practice, relaxation and a short meditation. Inspired by traditional yoga techniques practiced in India, Beth Hartig and Nicki Bailey bring an authentic feel to all of their classes. The classes are suitable for all abilities, from complete beginners to advanced yogi’s. The style and pace of the classes allows every student to connect deeply to their own body and breath. It is our intention to show you that the pose isn’t the goal. Through our practice of yoga we can access a place of peace and presence that is always within us, we just perhaps haven’t connected with it for a while. You will leave you mat feeling grounded, open and inspired.